Friday night I logged on with the hopes of raiding SSC. I was invited into the raid right away which was a good feeling. I’m starting to think I have earned my spot as a core raider now and a little bit of the worry of having to sit out is going away. You would think with 70+ level 70’s online and in the guild finding the right group makup would be easy. For whatever reason we had no mages and we were missing our fire resist geared lock so the GM decided that we would go do Void Reaver while we waited for the correct makeup for Leo to hopefully sign in. We have a druid tank in the guild who talks and talks in vent all the time, dude never shuts up. On Friday he talked more than normal, and as the raid cleared through TK you could actually tell the dude was getting high. I get pretty irritated at people who just talk to hear themselves in vent, I would much rather have a quite vent and everyone paying attention to what they are doing. I was especially getting irritated that this dude was talking and was high because he was making hardly any sense. Friday is my night to relax from a long work week and I really didn’t feel like listening to this j@ck off so against my better judgment I piped up on vent. Luckily I wasn’t the only one because the GM said he is kicking the druid out of the raid. When the druid heard that he was getting kicked out he says. It was crazy bizarre but I have to say the whole conversation of killing someone strait to lasagna was pretty funny. After that brief piece of oddness we cleared the last few trash mobs in front of Void Reaver. The trash dropped the tanking ring, but still being new to the guild I didn’t have the DKP to win it. I’m damn close though to finally having the DKP to getting items that I want. T5 shoulders and Lurkers mace shall soon be mine! 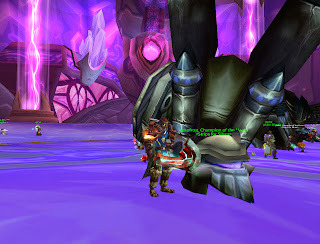 I was one of three tanks to be in front of Void Reaver. This time I ended up holding agro on Void Reaver for well over 60% of the time which was kind of fun. Void Reaver died in one shot and I remembered to get a screen shot this time. After Void Reaver the raid headed into SSC for some Leo attempts even though they didn’t have the correct makup the people still wanted to get in some attempts and learning encounters. I was happy to go, but since we didn’t have our main warlock with this fire resist set the attempts were pretty futile. I’m not sure how close they got him on Saturday night since I was out with friends and couldn’t raid that night. I didn’t get to do as much honor grinding as I wanted with my hunter but I still did earn over 10,000 by doing Pre-Made AV’s. My Horde Arena’s went pretty good this weekend as well. We went 7-3, which I was pretty happy with. We bumped our arena team almost back to 1400 (Yeah that’s lousy I know, but you have to remember we each have a little more than 100 resil and no healer). There is really no other interesting news horde side. I tried to do some AV on Raydz as well but alliance just kept getting smoked and there was no Pre-Made Av’s going on, but there was a PVP guild doing some premade AB’s and needed a MS warrior. Since it was the daily and I needed to respec for my arena’s anyways I figured what the heck. I was in for a pleasant surprise because these guys knew what they were doing. We 5 capped several games in a row and I earned about 4,000 honor with raydz before I had to log off to go take care of my kid. 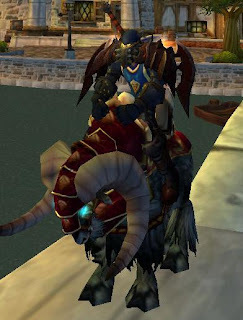 I also capped out several stacks of BG badges so I went ahead and bought myself a new PVP mount for fun. The Dwarf mounts are pretty tight looking. Tonight will probably be another PVP night, and starting Tuesday ill be back into raid mode. Grats dude, you should start a blog so we can all keep in touch with eachother and stuff.